Cannifest is a celebration at the intersection of cannabis and life. Come out and celebrate commUnity and all things green at Humboldt’s manifest cannabis festival! We are currently planning the lineup of music and events for Cannifest 2018. More details will be released soon. There’s something for everyone at Cannifest. Check out some of our staple events below. Celebrate the Cannifest Live Art Award & the Cannifest Functional Glass Award. Learn More & Sign up now! Do you have the skills it takes to beat the friendly competition. Which event would you do the best in? Sign Up or Learn the Rules Here. See below for the full stage schedule. If you want to check out the non-stage events, you’ll have to browse around to the Family Interactive Zone (FIZ) or the Community Events page. All Day Events include the Live Art painting and Glass Art judging in the Main Hall. as well as sponsors and exhibitors in Area 215. Door Games [11am-1PM] include the Hydro Pebble toss, the 100ml pour, and the disc toss all start at 11am and continue until 1pm. Humboldt Grow Games: Sign Up! 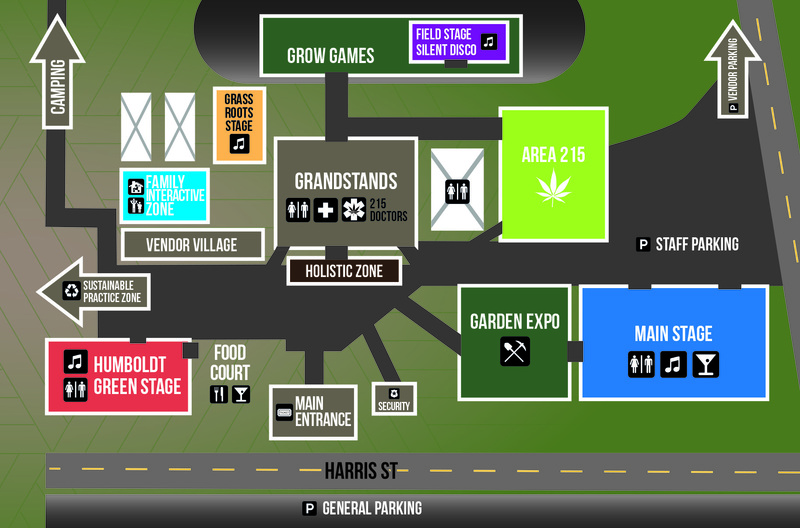 All Ganja games run from 12pm to 6pm Saturday. They include the Seed Count, Guess the Weight, and the Shake and Sniff contest. Tie breaker will be the Joint Roll-Off. The Ganja games continue on Sunday with the Seed Count, Guess the Weight, and Shake and Sniff contests running from 12pm to 3pm Sunday. Sunday will host the 3:30pm Joint Roll Off. The Cannifest Bowl will be awarded on Sunday at 5pm. Please note that this schedule and timeline only includes the STAGES where Cannifest talks or music is going on. If you’d like more info about what else is going on, please check out the Family Interactive Zone or Community Events pages. There will also be Live Art on both days in the Mail Stage area (Franceschi Hall). Also Area 215 will have DJ’s and the Mumu Crew on Sunday that are not listed below. Take your career to a new high! Tickets will be sold online thru World Famous Productions, as well as at The Works, Wildberries, People's Records, or any Northcoast Horticulture Supply store. Please click here for tickets! Cannifest is the weekend of April 15th & 16th, 2017 at the Redwood Acres Fairgrounds in Eureka, California. We offer discounted rates at some local hotels, as well as limited camping spots for both tent and RV. First come, first serve on RV spots.